This is it. This is the Act we have all been waiting for. When all semblance of what is real has been cast aside, when reality as we know it becomes a figment of the imagination, when truth is merely an annoying inconvenience, when the gesture, the emotion, the shout, and the articulation are everything. Yes, that is the very essence of political performance art. Yesterday, we had the good fortune of seeing this extraordinary Action live on the Senate floor. It was exhilarating: actually triumphant in its total annihilation of the political system. It was a revolution in the making, live for the C-SPAN cameras. 21 intoxicating hours of performance magic. 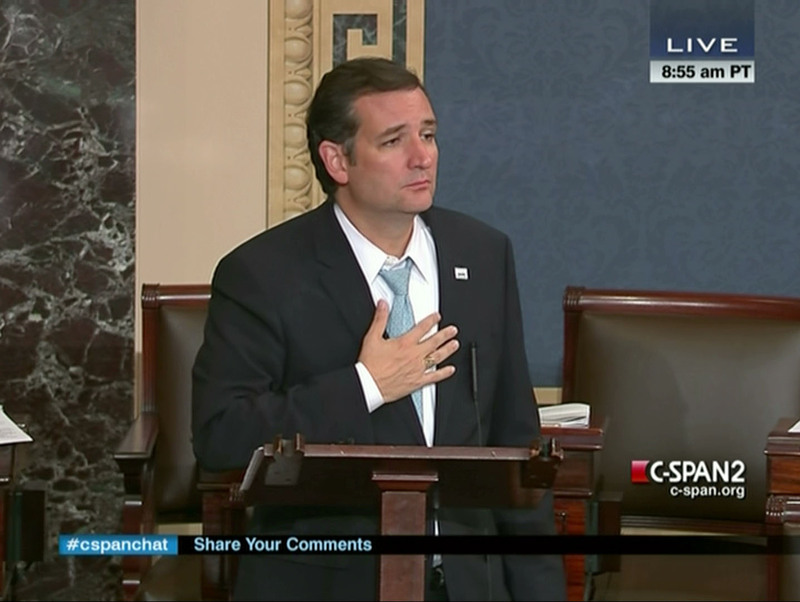 I declare here and now, that no performance artist could have demonstrated the sheer audacity of Ted Cruz. No performance artist could have been so perfectly in sync with the moment. When you abandon all notions of humanity, performance is set free. Much like Hitler or Mussolini or even Richard Nixon: this is what happens when you are completely free of the burden of a moral compass, when you speak without fear of retribution, when you demand the world stage for your own outsized, extravagant view of yourself. This is pure pomp, pure self-adulation, pure glory in the light of the media. It was breathtaking to watch. I am extremely jealous of Ted Cruz. His purity is to die for. His self-glorification is a thing to behold. If Ted Cruz believes in a God, it is surely none other than Himself. This was the Ted Talk of all time. When you have complete and total command of your own convoluted world view, your own cosmology of yourself, your own fantastically constructed ego laid bare… watch out! You can be blinded in this form of self-constructed logic. You begin to Believe. Yes, Believe. In what? In the labyrinthine entanglement of disinformation alchemized into what Stephen Colbert would call “truthiness.” It almost makes you giddy to think about it. This is what they call in the theater: the suspension of disbelief. There is no argument, no challenge, no well-constructed logic, no high road, not even a low road, that can bring Ted Cruz to his knees. This man is a perpetually spinning locomotion of performance stripped of purpose. There really is no purpose here: if only to utterly dismantle everything we might hold as essential to our former sense of human dignity. This is the annihilation of dignity, of reason, and whatever remaining protocol may be left in the United States Congress. This is our democracy expiring, it’s last sigh, in one fine denouement-inspired, apocalyptically-conceived, 21-hour spectacle of performance. But, in the post reality, there actually is no ending. It simply doesn’t end, unless we stop it.